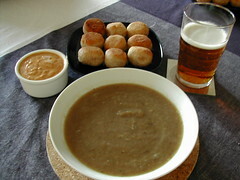 Was reading the Delicious Days food blog, and saw a recipe for these fantastic dough balls. They’re just like the moreish pizza balls at Pizza Express that everyone fights over. So I thought I’d give them a try today. I don’t usually have fresh yeast lying around, and have a small packet of Doves Farm dried yeast in the fridge for the odd breadmaking impulses. So I had to modify the recipe a little. I used 150g spelt flour and 150g bread flour, both from Doves Farm (mainly ‘cos I bought the spelt flour on impulse, and it’s not really suitable for most of my other baking). To that, I added 1 tsp of dried yeast, 1 tsp salt, and a pinch of sugar (not entirely necessary as the sugar in the recipe is probably for the fresh yeast culture to use). The resulting dough balls probably weren’t as light as they could have been, but that’s probably down to the flour mix and the amount of yeast I used. To go with the dough balls, I made some aubergine soup with red pepper cream. It’s not a pretty looking soup, but it’s real tasty! The recipe comes from New Covent Garden Soup Company’s “Soup and Beyond” cookbook. It’s a fantastic cookbook, and I’d recommend it for anyone who has enjoyed their pints of soup. Cook the onion, garlic and aubergine in the olive oil on low/med heat for 20 min without colouring. While the aubergine is cooking, grill the pepper until the skin has blackened. Place in a plastic bag (makes it easier to peel the skin off). Purée the pepper with the cream, chilli and some seasoning. Allow the aubergine to cool slightly, then purée with the chicken stock. Reheat. Serve with the red pepper cream spooned on the top of the soup. First posted 13 April 2005. 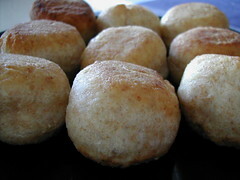 Technorati tags: dough balls, recipe. This entry was posted in akatsuki eats. Bookmark the permalink.